ISLAMABAD: Foreign Minister Shah Mehmood Qureshi said Pakistan is keen to increase bilateral cooperation with Tajikistan in all fields as both the countries are key partners in the region. In a meeting with Tajik Prime Minister Qohir Rasulzoda on the sidelines of the 17th Meeting of the Council of Heads of Government Meeting being held in Dushanbe, Tajikistan, he congratulated the Tajik Premier for the successful convening of the meeting in the beautiful city of Dushanbe, a Foreign Office statement said. The foreign minister conveyed the greetings and warm wishes of Prime Minister Imran Khan to the Tajik prime minister. The two sides discussed issues of bilateral, regional and international issues of mutual concern and agreed to strengthen and enhance cooperation in the area of trade and investments. Noting regular political and parliamentary exchanges, the foreign minister underlined the importance of closer economic and investment ties and reaffirmed Pakistan’s desire for further intensifying bilateral cooperation in all fields. The two sides agreed that bilateral security and defence cooperation was developing satisfactorily and noted the progress on CASA-1000 project and agreed on fast tracking its implementation. The foreign minister extended the invitation to Prime Minister Qohir Rasulzoda to visit Pakistan at his earliest convenience. 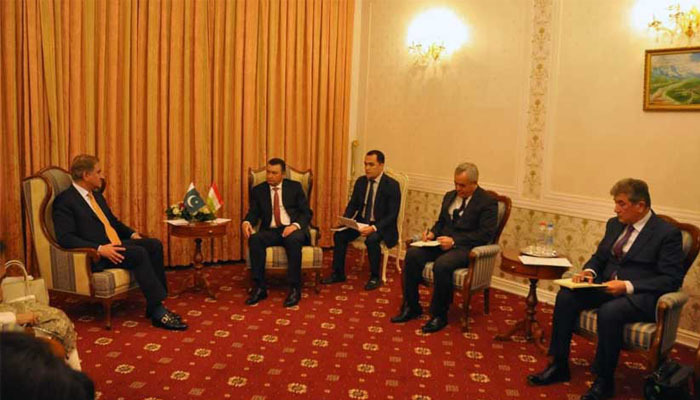 Pakistan was one of the first countries to establish diplomatic relations with Tajikistan soon after its independence. The bilateral relations between the two countries are based on mutual respect, shared interests and brotherhood and have been growing positively and steadily over the years.